Preheat your oven to 425 degrees F and prepare your tart shell in an 8-inch tart pan, placing it in the refrigerator to keep cool while you prepare the rest of the tart. Place all ingredients for the filling (chopped apples, lemon juice, sugar, and water) in a medium-large saucepan and stir to combine. Cover with a lid and cook on low heat for about 20 minutes, or until the apples can be easily broken apart with a wooden spoon but not so much so that it turns to apple sauce. Texture is good! Let the apple mixture cool slightly, then pour it into the prepared tart shell, filling it 3/4 of the way up. Begin to layer the thin apple slices closely together around the tart, starting at the edge and overlapping in a ring around the tart. Use the paper thin apple slices to fill in the center in a rosette design. The apples will shrink so be sure to top the tart generously so that no compote is visible. Dot the top of the tart all over with the butter and place in the oven. Bake for 10 minutes at 425 degrees F, then reduce the heat to 350 degrees F and bake for 50-60 minutes more. The apples should be soft and brown on the edges and the pastry should be golden brown. Remove the tart from the oven and let cool while you prepare the apricot glaze. Put the apricot jam in a small glass bowl with the water and stir. Microwave on high for 60 seconds until it is melted. 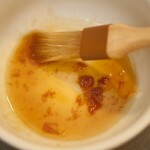 Using a pastry brush, brush the top of the tart with a thin coating of the apricot glaze. Serve slightly warm or cold. This tart is delicious for breakfast, lunch and dinner!